BED BUGS! Perhaps the most infamous pest for homeowners and hotels, bed bugs can be extremely difficult to remove once established in your home. Most people have at least heard a nightmare story of a bed bug infestation, and naturally, no homeowner wants to deal with these tenacious pests. The question then, is how do you ensure that you never have to? We here at Canton Termite and Pest Control have decades of experience in the pest industry, and during that time we have seen and treated hundreds of bed bug infestations. During that time, we acquired quite a bit of firsthand knowledge about how, why, and when bed bugs infest homes. By sharing this knowledge, we hope to aid homeowners in their goal of keeping bed bugs out! So how can bed bugs get into your home? And what are the common signs of an infestation? The most common way bed bugs enter a home is via human traffic. Since bed bugs are a parasitic species, they will often hide in areas that come into close contact with humans, and this can include your luggage. Bed bugs will often sneak into luggage, used furniture, linens, and storage, and people will then bring these items into the home without knowing that they are bringing the bed bug passengers as well. Once they are inside the home, bed bugs will often find a dark, secluded space to hide. While they can effectively hide in any part of the home, bed bugs typically seek out areas that are nearby to humans as they require a source of blood to survive. Thus this leads to them to often infest in and around beds, couches, carpets, and any other parts of the home where you might rest and relax. Bed bugs are nocturnal, and because of this they will only emerge to feed late at night, when their host is sleeping. Bed bugs can sustain themselves on blood from any warm blooded mammal, but they have a particular preference for human blood. While the concept of a parasitic pest feeding on blood sounds very troubling, bed bug bites themselves are not a threat to the health of a human. They are typically painless and will only begin to itch 24-48 hours after the feeding occurs. While bed bugs are not known to carry any diseases, it is possible for the bites to become infected if they are not disinfected properly. Bed bug bites are often the first sign of their activity in your home that you will identify. If you are trying to identify bed bug bites as opposed to those of other pests, it is important to remember that bed bugs tend to leave bites in areas that are exposed during sleep. 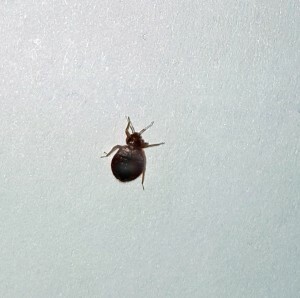 So a grouping of reddish, itchy bite marks on the arms, legs, and neck could be evidence of bed bug activity. If you see signs of bite marks, you should check around the area for other signs of bed bug activity. Bed bugs often hide out in small cracks and gaps in and around the mattress, and thus you may find small black/brown dots and stains left behind. You should start your search by checking common infestation areas such as behind headboards, on mattress seams, carpets, or beneath the mattress itself. While these are not the only areas that bed bugs can infest, they are a good first start for determining whether or not you should call a professional service for a more detailed inspection. What steps can homeowners take to keep their home bed bug free? And what should they do if they do see signs of bed bug activity? Keeping your home bed bug free is largely centered around taking the proper precautions to avoid introducing the infestation to begin with. Homeowners should thoroughly check any furniture, luggage, or other storage BEFORE bringing it into the home to ensure that no bed bugs have tagged along. Beyond this, it is also important to have regular inspections of your home so that any evidence of pest activity can be detected in its early stages. This will make treatment processes significantly easier and save you time, expense, and frustration! It is important to note that, while bed bugs will frequently feed when a source is available, they do not need to eat frequently to survive. In fact, bed bugs can survive without a meal for up to a year! Due to this, bed bugs will sometimes go into hiding if environmental conditions are no longer in their favor. This means that, when treating bed bugs in a home, it is typically necessary to treat multiple times over a period so as to ensure that the entirety of the population is eradicated. If you are dealing with bed bugs, you want to rely on a reliable pest control service with the experience required to tackle the problem. At Canton Termite and Pest Control, we have decades of experience dealing with bed bugs, wildlife, and many other pests! We provide a wide range of treatment options that are affordable, effective, and backed by our industry leading 100% Satisfaction Guarantee!